"A flavorful guacamole that's easy to adjust to your heat or taste preferences. A little untraditional to make, but won't stay around long. Great with fresh tortilla chips or as a condiment on many Latin dishes." Place tomatillos, onion, garlic, and jalapeno peppers into a saucepan over medium heat, and pour in enough water to cover. Bring the mixture to a boil, reduce heat, and simmer until the tomatillos soften and change color from bright green to a yellow-green color, 5 to 8 minutes. With a slotted spoon, transfer vegetables to a blender, filling the pitcher no more than halfway full. Hold down the lid of the blender with a folded kitchen towel, and carefully start the blender, using a few quick pulses to get the tomatillo mixture moving before leaving it on to puree. Puree until smooth, about 1 minute; mix in salt, cilantro, and lime juice. Blend again for a few seconds just to mix. Scoop out the avocado flesh, and place into the blender; blend until well mixed. Adjust salt, cilantro, and lime juice before serving. I have been looking for a recipe like this for a long time!! 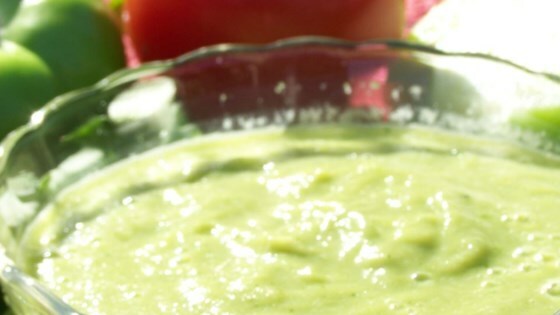 Its a great way to make a guac without using salsa or tomatoes!! I halved the ingredients, leaving out the jalapeno completely. Also added sour cream to match the portion of avocado. Tasted great. Made this just as written and it was delicious. Made as written.This was really easy and yummy! Great recipe! I loved the flavor and the ease of the recipe itself.